This is an audio-visual interview of a Bhari Gan practitioner discussing the general aspects of the theatrical art form. The interviewee Sri Ushini Rabha is a ‘Mul’, i.e. a chief performer, of his Bhari Gan troupe namely ‘Sri Sri Ram-Krishna Bhari Gan Sangha Dal’ and the interview was taken on November 24, 2017 at his residence in Goalpara District, Assam. In the discussion Sri Rabha tells us his father was also a Mul of Bhari Gan troupe and how he introduced Ushini Rabha in to the art form at the age of 12 years. In the first part of the conversation Sri Rabha describes his troupe of 35 members including Bain (drum players), Jhali (cymbal players), Pali (associates of the Mul) and artistes that perform character roles with masks. They perform two plays namely Dadhi Mathan and Raban Badh Aru Sitar Agniparikha. He describes the nature and characteristics of the Bhari Gan performance and how late evening performances often have to be continued overnight. Sri Rabha also demonstrates aspects of a Bhari Gan performance and renders a few songs from his play. He then goes on to explain the significance of masks used in their plays and the beliefs associated with the masks. They use masks for the characters like Raban (Ravana), Ketuwa and Bhetuwa (the two associates of the demon King Ravana), Bibhishan, Patra Mantri, Sarathi, (charioteer of Ravana), Hanuman, Jambuban (Jambavan) along with others. Their masks are curved out of Gamari wood and are considered to be very sacred. 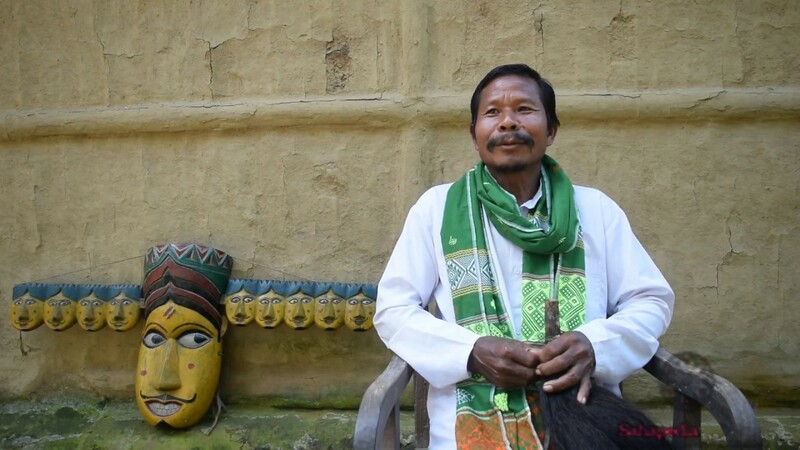 He details the various occasions and events related to Bhari Gan performances and states that most of the time they are invited for various rituals of the Rabha community, however invitation from other communities like the Bodos are not uncommon. They are invited to perform on occasions such as Shivaratri, Holi, Saraswati Puja, Lakahr Thakur Puja, Selaram Thakur Puja, Langa Thakur Puja and so on. There are certain forms of worship or ritualistic events of the Rabha community where a Bhari Gan performance is a must. He also discloses the challenges faced by them in continuing this drama tradition without any support. He says that this is not their profession; they live on cultivation and are practising this theatrical art form just to keep their culture and tradition alive. Camera and Editing: Arup Bordoloi.